a short video of an improbable feat. 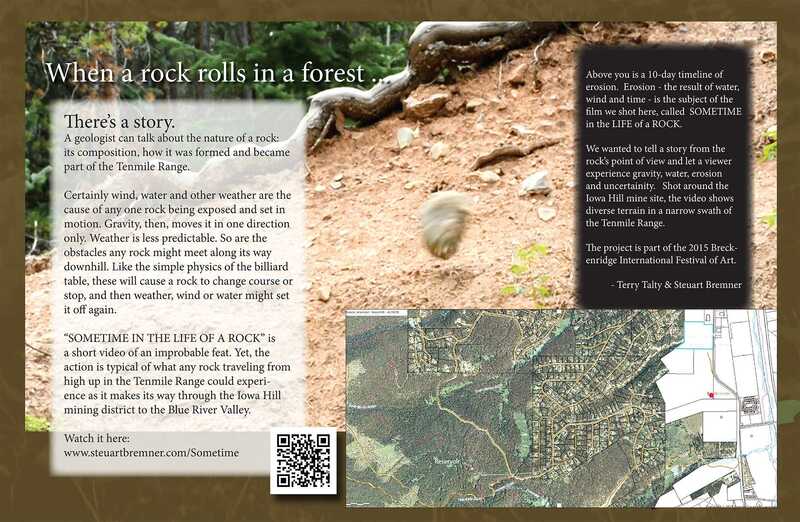 It tells the story of any rock's adventures high up in the Tenmile Range, through the former Iowa Hill mine site, down to the floor of the Blue River Valley. We made our own "Interpretive Sign" and placed it at Iowa Hill. The upper panel was transparent, so we could observe erosion from below it - rock level. Clay and stones from Iowa Hill formed a mass in upper quarter of the clear panel. While we were working on the piece, musicians came to play as part of the Trail Mix series of the Breckenridge International Festival of Art. Because Iowa Hill was so eroded by hydraulic mining in the past, there is very little shade. The trees that exist here are all less than 100 years old. 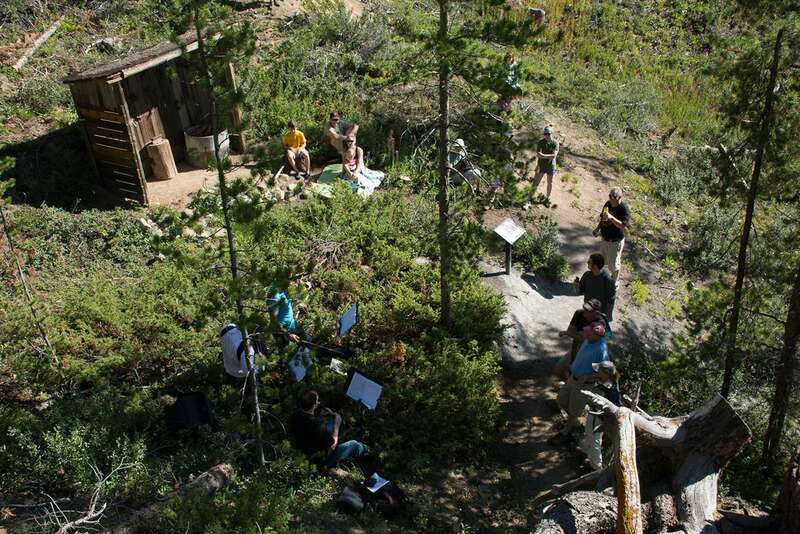 The musicians climbed the trail until they found some shade. We wanted to tell a story from the rock's point of view and let a viewer experience gravity, water, erosion and uncertainity. Shot around the Iowa Hill mine site, the video shows diverse terrain in a narrow swath of the Tenmile Range. 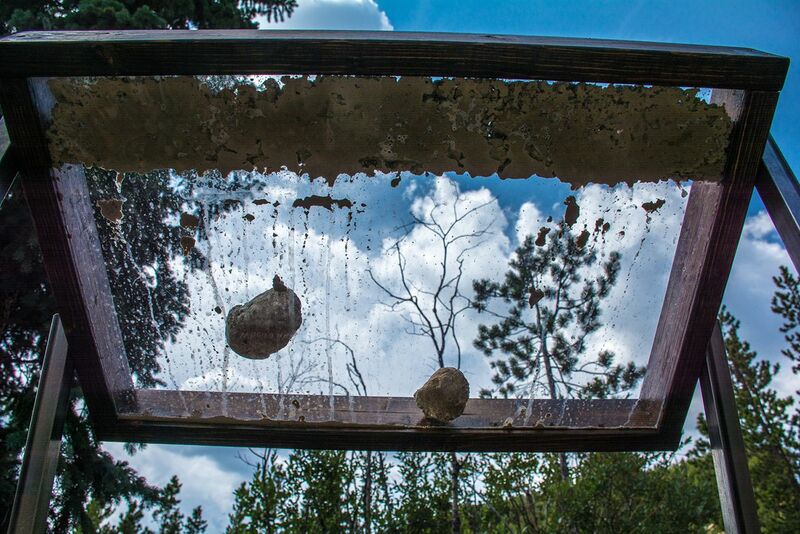 The project is part of the 2015 Breckenridge International Festival of Art. Certainly wind, water and other weather are the cause of any one rock being exposed and set in motion. Gravity, then, moves it in one direction only. Weather is less predictable. So are the obstacles any rock might meet along its way downhill. Like the simple physics of the billiard table, these will cause a rock to change course or stop, and then weather, wind or water might set it off again. Water, also playing by the rules of gravity, weighs and wears on a rock. Obviously, water smooths the rough edges as any rock that has made a journey from the top of a mountain like Peak 8 to the Blue River. What volume will move it significantly? Great volumes of water were damned above Iowa Hill and piped to the top of what we see now as a pretty steep cliff. Men opened flood gates there and water removed all the topsoil, those men took out the minerals, and more rocks than normal rolled downhill to the Blue River.